Having been born and raised in central Ohio where nature abounds and hunting and fishing are a daily mainstay, Mike developed a passion for the outdoors at an early. His passion for being outdoors and the joys that all things nature provides led him to pursue an education in horticulture, attending the Agricultural Technical Institute branch of The Ohio State University and ultimately graduating with a degree in Nursery Management. 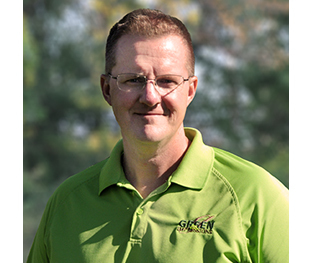 Mike then spent 14 years in tree and shrub production while working for Wade + Gatton Nursery in Belleville, Ohio and then Willoway Nurseries in Avon, Ohio prior to altering his course toward total grounds management and spending 9 years with Brickman Group. Mike serves our clients as Residential Account Manager Mike utilizing his extensive horticultural and landscape maintenance knowledge to help others enhance their outdoor living space, “their own piece of nature” as Mike describes it and is responsible for overseeing client relations, property enhancements, quality control, maintenance crew supervision, training and scheduling.